The Eastern Mud turtle is a small reptile measuring only 3 to 4 inches long. They are often confused with Musk Turtles or “stink pots” because they can emit a foul-smelling liquid when threatened. DESCRIPTION: Eastern Mud Turtles have 11 marginal plates while most other turtles have 12. The upper part of the shell, called the carapace, ranges from olive to dark brown and occasionally black. It is smooth, patternless and keelless. The lower shell, called the plastron, is yellow to brown and double hinged. Hatchlings have a red-orange plastron. The male is usually larger than the female, with a larger head, legs and tail. The tail of the male Eastern Mud Turtle comes to a bony spine at the end, while the female’s does not. The males also have rough, scaly patches on the insides of their legs. 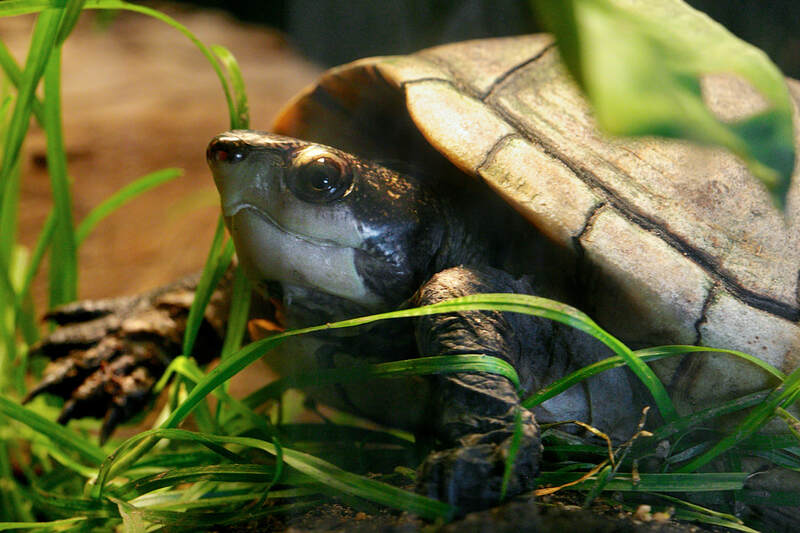 Eastern Mud Turtles have short, strong legs and webbed feet. 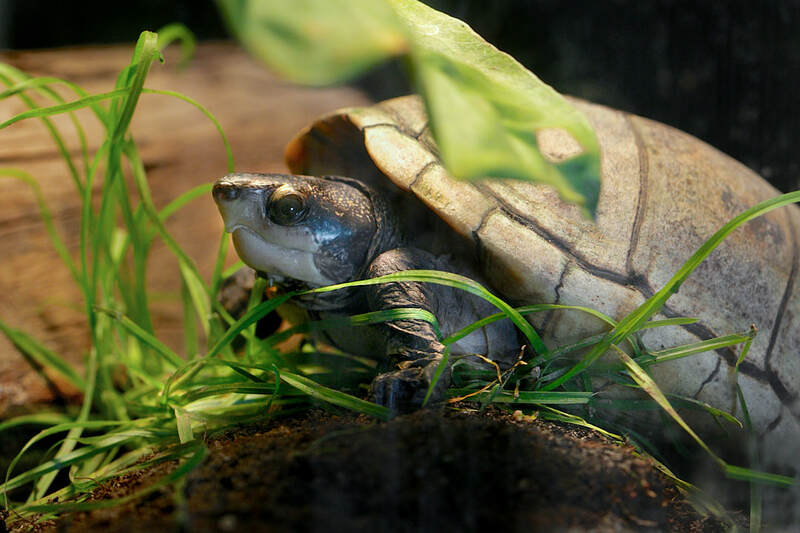 Eastern Mud Turtles who live in colder climates will hibernate from September to May. They dig hibernation burrows below the frost line in sand or dry leaves at marsh or field edges. They are slow moving on land and only travel about a quarter of a mile from their resident pond to their nest. They require shallow water, as they are not strong swimmers. RANGE: These turtles are found from Long Island, NY, south to Florida and west to Texas. HABITAT: These reptiles are semi-aquatic. They prefer shallow, soft-bottomed, slow-moving fresh or brackish water with abundant vegetation. They also need to be able to climb out of the water and get warm in the sun on rocks or logs. DIET: Omnivores – insects, mollusks, crustaceans, aquatic fauna, fish. Turtles don’t have teeth; they chew using the horny ridges that have little sharp groves, like a serrated knife, on their upper and lower jaws. FAMILY LIFE: The female will dig a 3 to 5 inch deep cavity in soft, loamy soil and deposit a clutch of 2 to 6 eggs. In northern climates this usually only happens once a year but in warmer climates this may happen up to three times in a season. Even after hatchlings emerge from their eggs in late Summer they remain underground until the following Spring. LIFE SPAN: The average lifespan in the wild is currently unknown but it is up to 20 years in human care. STATUS: Endangered throughout parts of their range.